Although 2016 brought some rough weather to many parts of the state, with extreme drought in much of the Piedmont and hurricanes and flooding in the east, some impressive yields still showed up. Based on the latest NCDA statistics, the statewide average yield was 35 bushels/acre, up from 32 bushels/acre last year. And although acreage was down from last year (1.66 million acres in 2016 versus 1.73 million acres in 2015), total production was actually up 5% to 58.1 million bushels. Some of the highest yields in the state came from well managed no-till fields in the Piedmont that got an extra shower or two or from fields in the Blacklands that were at a little higher elevation and didn’t go underwater during the excessive rains. In addition to decent yields across the state, several growers topped 70 bushels/acre. Last week, at the North Carolina Commodities Conference, the state soybean yield contest winners were announced. While we didn’t break any state records or hit 100 bushels this year, some impressive yields showed up in the 27 counties in this year’s contest. The highest recorded yield in the state in 2017 was 87.8 bu/acre from John Ashcraft of Union County. John was awarded a plaque and an expense-paid trip to Commodity Classic by the North Carolina Soybean Producers Association. John’s soybean agent was Andrew Baucom. Andrew also was awarded an expense-paid trip to Commodity Classic. Other winners across the state are listed below. Each area winner received a plaque and a $50 cash award from the North Carolina Soybean Producers Association. There is also a contest for Most Efficient Soybean Production. The winners are in the table below. Looking at the production practices of these top yielding growers, a few things stick out that may be helpful to all growers for increasing their soybean yields. Row Spacing. All the contest winners had a row spacing of 20-inches or less. 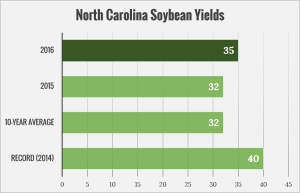 We have lots of data across North Carolina and the US that demonstrates yield increases of 5-10 bushels/acre by reducing row widths to below 20-inches. Planting Date. Almost all of these contest winners planted by May 15, many even planted in late April. There is a good amount of data to support early planting systems in soybeans. If early planting is an option for your operation, it may be worth exploring. Keep these points in mind as you plan for 2017. We would love to see statewide yields back to our 2014 record of 40 bu/acre but in order to increase yields across the state, growers must be willing to focus on increased agronomic management of the crop. We are also still waiting for an NC grower to break 100-bushel beans. Remember there is a $2,500 prize for the first grower to do this (or the highest yield over 100 bu if multiple growers surpass 100 bu in the same year) and if you’re an NC Soy Alliance member we’ll double it to $5,000)!